Dalberg, the Global Compact and the Financial Times came up with an unusual ranking... instead than companies are ranked it was NGO's and UN agencies that got assessed by corporate leaders against certain criteria (Accountability, Adaptability, Communication, Execution). For the full ranking tables and background information see FT or Dalberg. Ranking are always disputed and setting criteria for such an homogeneous are such as NGOs and UN agencies this is far from an easy job. Having such diverse NGOs on the same piece of papers might appear a bit random to some but nonetheless I think it's a good start for increased transparency and stimulating improvement through sharing of best practices. BTW not a big surprise than Rotary and Lions make it to the top considering that their members are mainly business people. 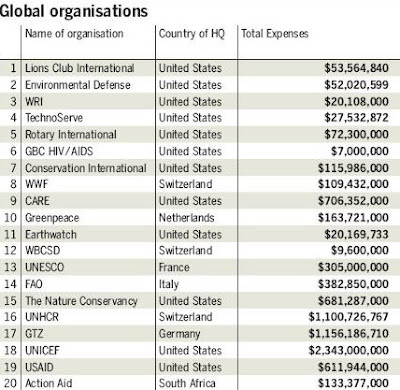 The only other ranking of NGOs - although focussed on US charities - is Charity Navigator. Do you know any else?